I have appeared before Judge Dzintra Janavs dozens of times in the past. She probably ruled against my clients’ positions as often as she ruled for them, but she was a hard working, very smart and very effective judge. Her defeat in Tuesday’s election is saddening, and that she should be eliminated in favor of a partisan bakery owner – who 'ran against her because she was Republican' -- only adds insult to injury. Judge Janavs was not removed from the bench for incompetence or misconduct, and she is as well-qualified now as she ever was. There is nothing to prevent Governor Schwarzenegger from reappointing Judge Janavs to the bench whenever the next vacancy opens on the Los Angeles Superior Court. Informed Democrats are as appalled as anyone else over this election result. Reappointing Judge Janavs would be a non-partisan gesture maintaining the caliber of justice dispensed in Los Angeles. Thoughtful citizens of all political persuasions should urge the Governor to correct this error and to return Judge Janavs to the bench where she belongs. The voters spoke, and now it's the governor's turn. In Tuesday's election, Lynn Diane Olson, who co-owns Manhattan Bread & Bagel in Manhattan Beach with her husband and has barely practiced law in the last decade, bested Janavs, a 20-year veteran of the bench. So: an anticipatory "Welcome back, your honor!" from Decs&Excs to the still-Honorable judge Janavs. And now I have to sit right down and right a few more letters. . . . In California, judges are most commonly appointed by the Governor, but all sitting judges must periodically stand for election. That judicial election/reconfirmation process famously resulted in the voters' removal of California Chief Justice Rose Bird and two other justices from the state Supreme Court in 1986. This year, only one current judge out of 140 on the Los Angeles Superior Court drew a challenge, and the outcome reflects rather badly on the electorate. Office No. 120: Dzintra Janavs is a charming, commanding, experienced and often brusque and impatient judge who earned the distinction of being the only one to draw a challenge among the more than 140 Los Angeles Superior Court judges up for election this year. The challenge comes from Lynn Diane Olson, an attorney who has been on "inactive" status for most of her career while she ran Manhattan Bread and Bagel, in Manhattan Beach, with her husband. Olson could articulate no good reason to challenge Janavs, except to say that a judge should have to defend her seat. Olson may make the better bagel. Janavs would remain by far the better judge. Judge Janavs has presided for over a decade in one of the central "Writs & Receivers" courtrooms in downtown Los Angeles, meaning that she has had a steady diet of complex injunctions, administrative mandamus proceedings, and the like -- tough stuff requiring intellectual heft and solid judicial demeanor. Looking back, I would have to say that she ruled against my clients as often as she ruled in favor of them. She was all of the things that the Times says, above all experienced, very smart, attentive and hard-working. Even when I disagreed with one of her rulings, I had to admit that she had listened closely to my arguments and was able to articulate detailed reasons for not being persuaded by them. The speculation prior to the election was that Ms. Olson had chosen to challenge Judge Janavs in particular not because of any quarrel with Judge Janavs' rulings or qualifications, but because the judge has a "foreign-sounding" name. (Judge Janavs was born in Lithuania, and has the accent to prove it.) Given that the average voter is usually completely in the dark about anyone running for a judgeship, it is all too conceivable that the sound of a name might be the particular irrelevant factor deciding how a vote is cast. Hail and farewell, your Honor, you will be missed. 'It came down to her unusual name, nothing more,' said consumer advocate and attorney Harvey J. Rosenfield. Rosenfield, who was frequently in Janavs' court when she was assigned to hundreds of consumer cases related to an insurance reform measure he promoted, said he thinks the outcome reflects a flawed system. The public's knowledge of a candidate should not be based on the ability to raise money to get the message out, he said. . . .
'There's something unseemly and dangerous that judges have to raise money to run for office,' he said. Rosenfield's point has merit . . . but it is a peculiar and somewhat inconsistent sentiment coming from a man who counts among his prouder achievements Proposition 103's transformation of the office of Insurance Commissioner from an appointed to an elected post, "accountable directly to the people." Elective Democracy: "unseemly and dangerous" or a guarantee of "accountability to the people"? For Harvey Rosenfield, it all seems to depend on how each particular election comes out. Extortion! Blackmail! Auto Insurance Rating Factors! Who would ever have suspected that High Drama could surround the ongoing argument over "ZIP Code" rating of auto insurance policies? And yet, yesterday, the running dispute between California Insurance Commissioner John Garamendi and the insurance industry over auto insurance rates boiled over into foaming, finger-pointing hubbub. It must be an election year. First, to recap how we got here: When voters passed Proposition 103 in 1988, they imposed rate regulation on most lines of insurance in California. For automobile insurance, Proposition 103's supporters urged that the new regime required that rates be set first and foremost based on the insured's own driving record, with other risk factors diminished or disregarded. Through a series of regulatory revisions, insurers were given the flexibility to utilize factors other than driving records, and many insurers began to emphasize geographical factors -- where the insured car is principally located -- more heavily than other considerations. This approach drew criticism from Prop. 103 supporters, who characterized it as a "betrayal" of the Proposition's intent. At the beginning of this year, Commissioner Garamendi introduced proposed regulations that would make it compulsory to weight driving record above any and all other factors. Insurers balked, arguing that they have actuarial data to prove that location really is more closely tied to the degree of risk than is the personal accident history of the driver. Further, they argued, elimination of ZIP Code rating will benefit urban motorists, whose rates will likely go down, at the expense of more rural insureds, who will likely see significant increases. One prominent insurance executive briefly floated the possibility of an insurer-backed initiative campaign to counter the Commissioner's proposals. Decs&Excs caught up with the story in early February. For their part, insurers secured an amendment to a pending Assembly bill, AB 2840: the bill's original provisions relating to surplus lines brokers were deleted, to be replaced by provisions that effectively prohibit the Commissioner from taking further action to alter existing rating factors for automobile insurance unless those changes are supported by an elaborate study to be conducted through the California Research Bureau, a division of the State Library. AB2840 has passed out of one committee and is scheduled for further hearings on May 10. Or, is the Commissioner trying to demonize what would otherwise be perfectly permissible 1st Amendment-protected efforts of the industry to be heard on an issue of public concern -- the proposed auto rate regulations -- because the timing of that effort happens to coincide with his quest for higher office? It is not hard to imagine a scenario, after all, in which the latter sort of campaign could negatively affect Garamendi in the primary: "Gosh, Muriel, if that Mr. Garamendi wants to raise our insurance rates, I'm surely going to support someone else for Lieutenant Governor when I vote in the primary." The answer, one supposes, will lie in the ads themselves. The Insurance Journal reports that the insurers' $2 million budget "will allow the coalition to educate households in the following counties: Butte, Del Norte, Humboldt, Imperial, Inyo, Kern, Kings, Mendocino, Nevada, Lake, Plumas, Santa Barbara, San Benito, San Diego, Solano, Tulare and Yolo." Those are mostly-rural counties, the sort that the industry contends will see rate increases if ZIP Code rating is abolished. If the insurers are indeed only intending an "educational" campaign directed to voters whose rates will likely go up, that certainly sounds like legitimate political discourse, regardless of its impact on the Commissioner's aspirations to the Lieutenant Governorship. If, on the other hand, the ads that begin to circulate actually are personal "attacks" on the candidate, that will be a different story (although still subject to 1st Amendment protections in this weblogger's opinion). 'I firmly believe that this amounts to a serious attempt to blackmail me in my role as California’s elected Insurance Commissioner. Clearly, I was offered a significant advantage. If I abandoned my responsibilities and delayed implementing the will of the voters, I would not be hit by a $2 million negative advertising campaign in the final weeks leading up to the June election. 'I do take this threat very seriously, but I will continue to carry out my constitutional duties and the expressed will of the voters in passing Proposition 103. Apparently, the people making this threat had hoped to hear otherwise. They mistakenly believed that I would consider the outcome of the next election to be more important than my obligations as Insurance Commissioner. They were dead wrong. 'While this threat was unsuccessful, I believe it is now my responsibility to stand up to this powerful special interest group and set in stone that they cannot engage in, much less succeed with such tactics. This is a serious threat not only to me, but also to the Insurance Commissioners who follow. They, and all other regulators, must be allowed to protect the consumers of California and carry out the laws of the State and people in an atmosphere free of coercion, blackmail and extortion. As detailed below, California Insurance Commissioner John Garamendi is not well today. Having no personal quarrel with him -- although I disagree with him often enough on matters of policy -- I wish Mr. Garamendi a speedy and uneventful recovery from surgery and a prompt and healthy return to his family and to his office. That said, I have to add that I am aggravated with the Commissioner's staff and with the way in which they chose to get the word out concerning the Commissioner's illness. In order to keep track of what is going on at the California Department of Insurance, I maintain an e-mail subscription to the Department's latest Press Releases. [Interested persons can get their own subscriptions here.] Several times a week, I will learn that the Department has arrested or convicted or obtained a confession from some participant or other in an insurance fraud scheme, or learn of new proposed regulations such as the recent proposals on "ZIP Code" rating of auto policies. While working on his ranch this weekend, Insurance Commissioner John Garamendi experienced some discomfort. Family members took him to the hospital, where physicians diagnosed a problem with the mitral valve in his heart. The Commissioner is scheduled for corrective surgery today. His surgeon anticipates a swift and full recovery. The Commissioner does not anticipate a significant disruption in his duties as Insurance Commissioner or in his campaign for Lieutenant Governor. According to the American Heart Association, 5 million Americans each year experience valvular heart problems. Additional information will be released following the procedure. The gratuitous health statistic in the closing paragraph is a nice touch, but the glaring problem here is the use of an official State communication to refer to, and tacitly to endorse, an incumbent office holder's election campaign -- a campaign, mind you, for a different State office. I would hope, especially given that he has more compelling things to hold his attention at the moment, that the uncomfortably self-serving quality of this release comes from an overzealous staffer and not from Mr. Garamendi himself. When Californians were persuaded to vote in favor of Proposition 103, they were told that making the office of Insurance Commissioner an elective post, rather than an appointment by the Governor, would make the Department more "responsive" to consumers. Unfortunately, and foreseeably, all that was really accomplished was the creation of yet another Sacramento holding pen for career politicians and yet another outlet for the "permanent campaign." Scientists sometimes speak of the "observer effect," the principle that the observation of a phenomenon may itself alter the phenomenon being observed. A similar effect can be found in reports on risk: frequently, the manner in which a risk will be described is affected by the the predisposition of the describer. By choosing between absolute numbers or percentages, it is easy to make a risk sound either more or less severe. For instance, in reports identifying apparent links between thus-and-such a product or this-or-that behavior and the development of cancer or other serious illness, those who disapprove of the product or behavior will assure us that it "doubles" or "triples" the risk of becoming ill. Their opposition will prefer to point to actual numbers, e.g., "Yes, the risk is doubled: from 1 in 3 zillion to 1 in 1.5 zillion!" or "The average American is more likely to win three consecutive Academy Awards and the Nobel Peace Prize than to become ill from use of our product." Or a number will be tossed out that sounds large in absolute terms -- say, "10,000 a year" -- without reference to the size of the pool from which that number is drawn: 10,000 is a less impressive number if the total pool is measured in hundreds of millions or billions. I find it is a good policy to ask, when a frightening or reassuring statistic is blithely bandied about, "How might this same information be expressed in different but still accurate terms, and why do you think the speaker chose the particular version he/she did?" With 8- to 12-year-olds dying at a rate of more than one a day in automobile crashes, safety groups are pushing for more youngsters to remain belted in the back seat. Sounds awful, doesn't it? And, of course, each individual instance is awful for those immediately affected and it is a very good practice to wear a safety belt whenever and wherever you travel in an automobile. But is the "one a day" statistic a sound basis for public policy? 365 cases (366 in a leap year) out of a constantly regenerating population of nearly 300 million will strike some as a pretty small number. Those who favor that second expression of the facts may also prefer . . .
On U.S. roads, meanwhile, roughly 185,000 drivers, passengers and motorcyclists have been killed during this same time frame [five years]. Those 185,000 deaths, though, came over the course of nearly 15 trillion miles driven. This translates into one fatality for every 81 million miles driven. Although traffic accidents are the leading cause of death for Americans from ages 3 to 33, this would seem to be a pretty low death rate (especially since it includes motorcycles, which are far more dangerous than cars or trucks). How long might it take one person to drive 81 million miles? Let's say that for a solid year you did nothing but drive, 24 hours a day, at 60 miles per hour. In one year, you'd cover 525,600 miles; to reach 81 million miles, you'd have to drive around the clock for 154 years. In other words, a lot of people die on U.S. roads each year not because driving is so dangerous, but because an awful lot of people are driving an awful lot of miles. So Robert Frost was apparently right: "All the fun's in how you say a thing." As discussed below, California Insurance Commissioner John Garamendi is fighting hard to eliminate the actuarially-sound- but-politically-unpopular practice of "ZIP Code rating," in which personal auto insurance rates are largely determined by where the insured lives. Several hundred California residents who say they're paying too much for car insurance tried and failed to convince the U.S. Postal Service to allow them to migrate to a ZIP code where insurers charge cheaper rates. The Palo Alto residents argued they were unfairly paying too much because they share a ZIP code with the neighboring city of East Palo Alto, where rates are often higher because of increased accidents and break-ins, community organizers said. Two neighborhood groups asked the Postal Service to allow them to join other Palo Alto ZIP codes or create their own. But their request was turned down because it would be too costly to adjust postal boundaries for reasons other than speeding mail delivery, Rep. Anna Eshoo, D-Palo Alto, who handled the request, said in a letter last week to community organizers. 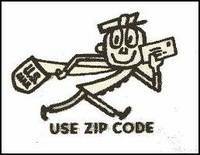 For extra credit: A brief history of the ZIP Code, containing no references to insurance, is available here.